Ari dreams of leaving his small town and quitting his job at the family bakery. He wants to move to the big city with his friends and bandmates. But in order to do that, he needs to find a replacement employee for the bakery. 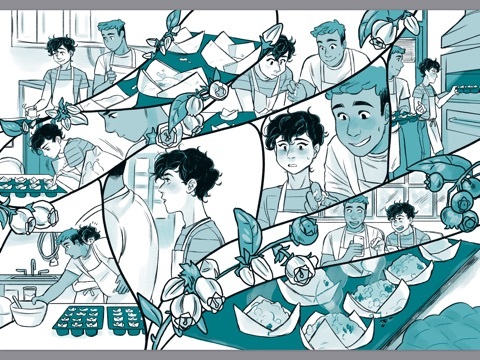 So when he meets Hector, a guy who actually went to school for baking and loves it more than anything else, Ari believes Hector is his ticket out of town. But while teaching Hector the ropes, Ari realizes maybe he already has everything he needs right where he is. I love a good graphic novel. Even the thicker ones only take a couple hours to get through, but still end up leaving an impression. Bloom is an adorable graphic novel. The story follows Ari and Hector the summer they first meet and the months that follow. Ari’s family owns a bakery, which Ari used to love but now wants nothing to do with. Hector, who just recently moved to town, loves to bake and falls in love with both Ari’s family and their bakery. The two obviously fall for each other, and even though it’s a fast-paced story, the love blooms slowly, which is really nice. And not only is the story cute AF, but so are the illustrations. They’re flowery and give you warm, fuzzy feelings. The only colors used are blues, blacks, and whites. It’s simplistic and conveys the right atmosphere for the story. As I mentioned, the story is fast-paced. I thought it was very choppy. Not choppy in a bad, doesn’t-flow type of way; more like choppy in the sense that time and scenes change without much indication. Like cuts in a film. I liked it. The story was still concise and was able to cover a larger chunk of time. I kind of hated Ari at first. He seemed incredibly two-faced and seemed to put blame on everyone except himself. But he got better. I think Hector really influenced his character, which makes me happy, but Hector honestly deserved better. Hector is amazing. There really wasn’t anything I disliked about him. He was a jack of all trades and made delicious-looking baked goods. I wish I could bake with him! What I liked most about this book was the significant lack of labels. No one categorizes themselves as gay or straight or bi. Those words are completely absent from the book and that makes my heart warm. I’m a huge believer in ridding our lives of nonessential labels. I don’t think we should have to give a name to every single type of sexuality. I think that just puts people in a box and also further distances us from one another. We are all human beings. We fall in and out of love. Does the other human’s gender really matter? Should something as trivial as gender be the sole deciding factor in what sexuality we label ourselves as? I personally don’t think so. I don’t fall in love with people based on their genders. I fall in love with people for who they are—I don’t even see genders, really. What I’m trying to say is, I like that Bloom normalizes two men falling in love with each other. We don’t have to call attention to the fact that Ari and Hector are two men. They’re just two people in love, and I think that’s beautiful. So, rant over. I hope you’ll go out and read Bloom because it’s a beautiful story with gorgeous illustrations. And it’s a super-fast read! Also, there’s a recipe for sourdough in the back that I’m dying to try……….